Summary: Such good weather we’re having, and it will continue through the week with slightly warmer than average temperatures. The weather’s been so nice over the last week, we took a break from our daily weather blog here to enjoy it! Now we are back to celebrate May the Fourth and to update you on this week’s weather. 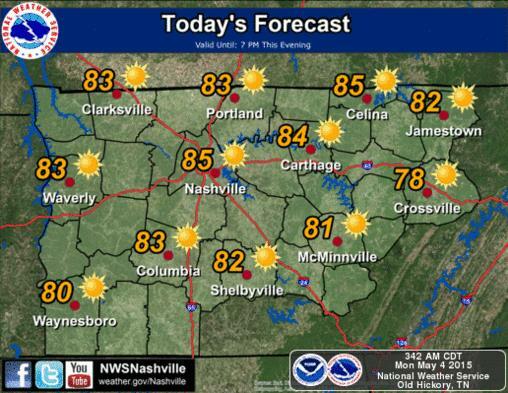 Today, expect sunny skies with our high temperature reaching 81 degrees. Winds will be coming out of the southwest at 5 to 10 mph. Tonight, temps fall to about 58 degrees with a few clouds in the sky and calm winds. Tuesday is pretty much going to be a repeat of today, with a high temperature expected to reach 83 degrees under sunny skies with winds coming from the south at 5 to 10 mph. Tuesday night, the overnight low will fall to about 59 degrees with a few clouds in the sky and winds calming. Repeat Monday and Tuesday for the rest of the week. The rest of the week is much of the same as well. Wednesday we will see a few more clouds in the sky, with temps in the mid 80s. Clouds clear out for Thursday and Friday with high temps remaining in the mid 80s. 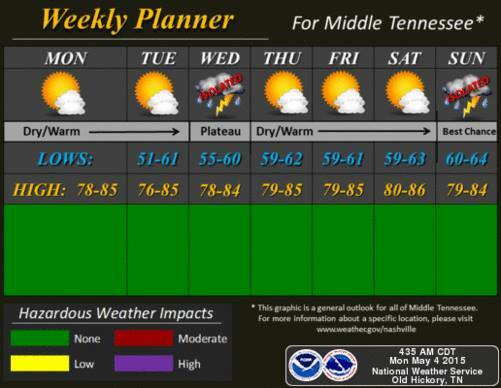 Overnight lows for Wednesday, Thursday, and Friday stay mild falling to the lower 60’s. So when is the next chance of rain? By now some of you may be wondering when we will see some rain again. Currently, we are looking at possible rain coming in Saturday night and into Sunday. Saturday night currently holds a 20% chance of rain and thunderstorms, and Sunday holds a 20% chance of rain and thunderstorms. It appears right now that rain on Mother’s Day will be isolated, but with this being several days away, it could change before the day gets here. Currently, no talk of severe weather, but this is because it’s too far away to tell. The start of the work week next week may see a better chance of rain and thunderstorms, but we will talk more about that in the coming days.